There have been rumors about an major upgrade for the stadium court at the Lindner Family Tennis Center. Those rumors are rumors no more as tournament officials have announced a $10 million expansion and upgrade project that will start immediately following the Western & Southern Financial Group Masters in two weeks and be ready in time for next year's events. 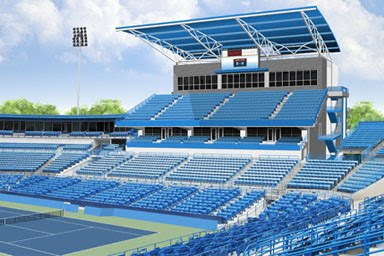 The $10 million project will be funded by the USTA, a majority partner in the tournament, and Cincinnati's Tennis for Charity. The upgrade will add an additional 890 stadium seats, 6 new luxury suites, major media facility upgrades, and player amenity improvements that will clear the way for the now separate men's and women's tournaments to be combined and held simultaneously...all making the biggest summer tennis tournament in the United States, outside of the US Open, even bigger. The most prominent addition will be the new 52,000 square-foot West Building that will house the new luxury suites, seating capacity, player and media facilities. Tournament officials say that the new West Building will be twice as tall as the existing structure and rise some 97 feet above court level.